In this project we will be making a trigger for a camera’s flash. This flash trigger will be controlled with a microcontroller like Arduino. 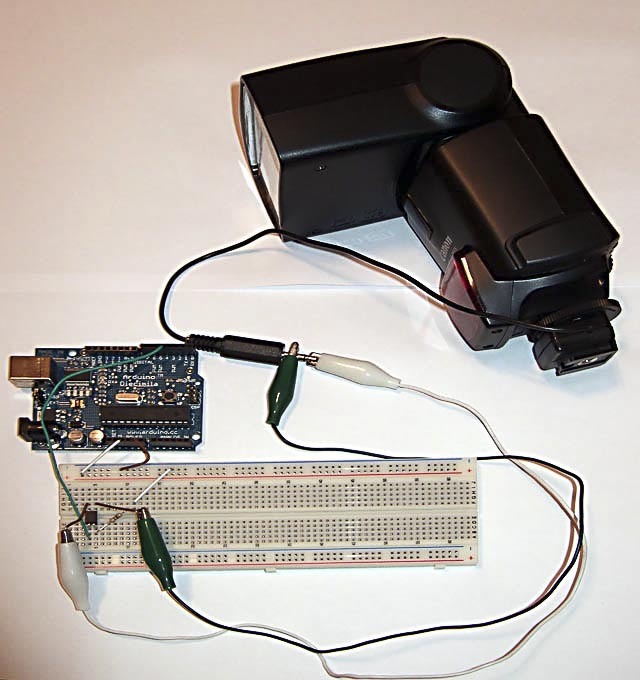 Today, I’m just covering how to trigger a camera flash with a microcontroller. Most likely you will also want to attach a sensor to a different port on the microcontroller and use that sensor to activate this flash trigger. Some people might claim that using a microcontroller is overkill for a project like this, but I don’t think so. There are several advantages to using a microcontroller over one of a circuit like this. First I think using a microcontroller is easier to implement. Second you can modify the code to use multiple sensors or add in any delays you want. It’s just a more robust system and it doesn’t cost that much more. You can get an Arduino microcontroller for around $35. Here is an article I wrote describing different sensors you can use with this flash trigger circuit. The first thing you need (besides a microcontroller which I assume you already have) is a female hotshoe to use with your flash. I bought this one for $20. It was cheap and it uses a standard 1/8 inch jack. This is much better than the flash sync cables that are notoriously unreliable, but any hotshoe should work so if you have one with a standard sync cable use it. 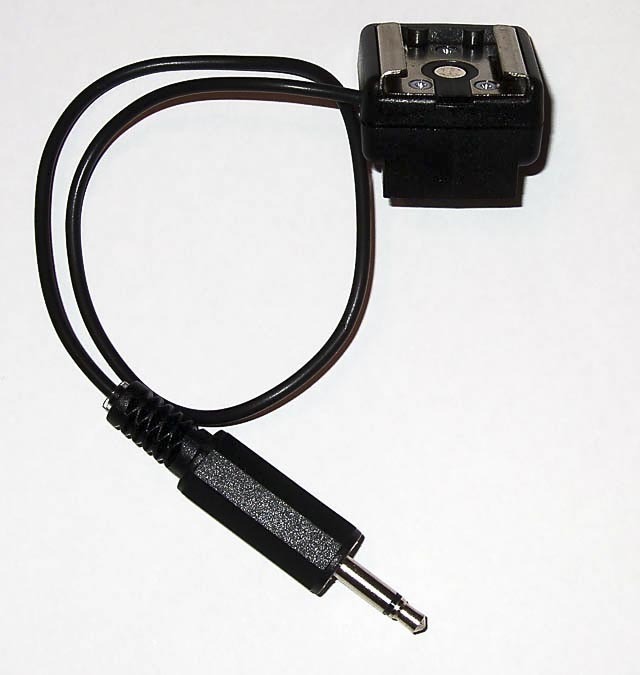 All that needs to be done to trigger the flash when it’s in the hotshoe is to short the two wires or contacts. I used a optoisolator (here’s the datasheet)as a switch. Optoisolators have the added benefit of protecting my Arduino board from any voltage spikes that might occur on the flash. The software for this project is very simple. I just send a high signal to the optoisolater for 1/10 of a second when the spacebar is pressed. This triggers the flash. // This code just lets you turn a digital out pin high for a short time. // That's all that is needed to verify the flash circuit is working. // Press the space bar to trigger the flash. Hi, my name is Nick and I am a Houston performance artist looking to put on a show soon that will incorporate sound and strobe lights. Essentially I will have a 2.5 min. wav. track of applause and cheering that will rise and fall in volume. I want to translate these “waves” of sound into a similar wave of strobe lights, so that as the cheering grows louder so do the strobes frequency. 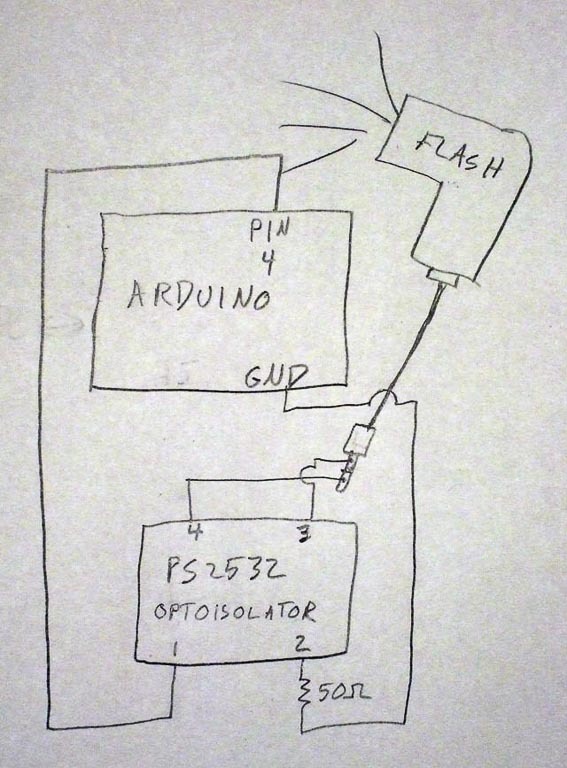 My question for you is: How would you hook up a strobe light to the Arduino instead of a camera flash, seeing as the strobe is controlled by a pot? I read your article on triggering a flash with sound thresholds so I think I will be able to handle the input of the wav. track. My hang up is how to get the Arduino to communicate with a string of strobe lights. If you could possibly point me in some direction I would greatly appreciate it, im pretty lost right now. Thanks. NICKTEEL. I’m not familiar with the strobe you’re talking about, but it seems like you use a pot to adjust how frequently you want the strobe to be activated. So all you need to do is use the audio to adjust a resistance. Using a voltage controlled resister would handle this. I’ve never used one, but a search yielded this page: http://freespace.virgin.net/ljmayes.mal/comp/vcr.htm. I’m sure there must be premade circuits that make this easier if you search around. Another solution would be to just use a stepper motor or servo to adjust the pot. While not as elegant this would be easier for me since I have done this sort of thing before. I’m trying to make the basic flash circuit and having some problems. I ordered the optoisolator from spark fun and I’m using a Vivitar auto 215 flash. I don’t have a 50Kohm resistor, but I’m using a 47K and three 3K resistors, which may or may not be a problem. Other than that I believe the circuit is built correctly. The flash only goes off once when the alligator clips are being connected. If I remove a clip and put it back on it will fire when the alligator clip touches it but then remain unfired. It’s almost as if the circuit is staying closed all the time rather than osciallting back and forth. Not sure if any of that made sense, but I’d appreciate any help you could give me. Any ideas? I built the circuit with the correct resistor values but I have the same problem as Chris above. Maybe it is the brand of flash I am using (Promaster 1700) but when the flash is fully charged the voltage across the terminals is approx 270 volts and I have blown an couple power mosfets testing stuff out and the optoisolator you say to use. Am I doing something wrong or is there a component swap you could suggest. I believe 270 Volts should be ok since the whole point of the optoisolator is to isolate voltage spikes. Try adding the 100 ohm resistor from pin 3 to ground shown in this diagram to see if that fixes it. Also make sure the flash isn’t attached in reverse causing large negative voltages. It would be great if you could report back if any of this fixes your problems. I added the resistor that the sparkfun schematic suggested earlier this week when it doesn’t seem to help. The flash triggers sporadically like maybe 5% of the time like if the flash has had more than 30seconds to recycle and if the batteries are really new. I have been trying really hard with this circuit the past week for a time sensitive project. I am not an expert but I think maybe the internal circuitry may vary from flash to flash and influence how effective the optoisolator is. Let me know if you have any ideas. Thanks. but I would have to wait for the parts I would like your way to work because I already have them. I am station in Hohenfels, Germany. I am looking for a laser trigger for my Canon D1 Mark II, Can you tell me of how I am able to get one. Can you build me one?, I am going to use it to shooting while life photography for school. please email me back if you can help me. Thank you. You are one awesome guy! I’ve just put together both your flash trigger and the lightning trigger and both have worked as described! I couldn’t get a hold of the optoisolator in your description where I live and used an MOC3021 Triac Coupler which seems to do just fine with my flash (Starblitz 250BAZ). 6 and 4 for the flash leads. Thanks for all you work and tutorials! I find this project to be extremely interesting. Thanks for sharing it with us. But I know very little about electronics so I am having a bit of trouble understanding how the circuit works. I’ve googled till I’m blue in the face but haven’t been able to find anything that helps me understand. Can I impose upon you folks to give me the Idiots Guide to Optoelectonics? How does an optocoupler such as the PS2532 used here work? I’ve been looking at the datasheets for this one and many others and have seen them in various flavors… transistor output, darlington output, triac output, base connected or not. Does it matter which type one selects for an application like this, so long as one always connects the flash to the collector and emitter outputs? And of course select one with sufficient voltage handling for your flash. Speaking of which, would that be the Vceo specification in the datasheets? I think I understand enough of what I see here to know that the Arduino program is setup up to send voltage/current to pin 1 of the coupler. But what I don’t get is what is happening at the flash side of the coupler. I’ve read information that leads me to belive that the optocoupler is acting like a switch. So does that mean that when voltage/current is sent in on pin 1, that the electrical switch inside the device closes and essentially shorts the center contact of the flash to ground, thereby triggering it to fire? And the isolating properties of the optocoupler keep the input and output sides… well, isolated? In this application to keep the sometimes extremely high flash voltage from getting into the Arduino and frying it? I apologize profusely for the noob questions. But I’d be grateful if someone could help me learn what’s happening with this very cool project. Would appreciate advice on arranging for a strobe (e.g., Vivitar auto 215) flash when a 65msec signal trigger is delivered to the audio output of a PC. I am having the same issues as several of the posts above. I believe I have the pins in all the right places, but cannot get the flash to trigger with the space bar. This is my first time trying a DIY project so I have no idea when it comes to the technical lingo. If I looked at the image above and simply counted the holes on the breadboard to try and match your image, would that work or am I missing something critical? Any advice would be helpful!! I have also built a circuit similar to this, triggered by an IR emitter/detector. Like Ben, I have used the MOC3021 and it works fine with one flash that produces 85V across its terminals. when I try it with another flash that produces only 9V across its terminals, it doesn’t fire. I also tried a 4N32 optocoupler but had not success at all. I am also a noob at electronics, so reading the data sheets is like reading Greek to me. Why would the MOC3021 work with the first flash and not the second? What are the key elements in the data sheets that would help with this? I bought a cheap (ish) flash from Target and found that although the 2532 optoisolator didn’t work, this MOC3031 Fairchild Triac did: http://www.fairchildsemi.com/ds/MO/MOC3042-M.pdf and it’s available from US suppliers like digikey.com. Just connect the flash to pins 4 and 6. Pins 1 and 2 are the same as Mike shows above. Thanks to Martin for the Triac idea. I am having the problem that the flash only fires once – I then need to disconnect everything for it to work again. The flash is blocked after the 1st flash. I use a opto MOC 3023 and a 47 ohm resistor South side (between opto out and ground). I tried this project using a LED instead (with its own Arduino power source) and it worked perfectly. I don’t have another opto to try – but I did try several flashes (I’m a pro photographer) with always the same results. Blaise, this is a known issue with SCRs and modern flashes. The problem is the the modern flash has a low, but constant amount of current which prevents the SCR from resetting. While I haven’t looked up the MOC3023, my guess is that it is SCR based and that this is your issue. I’ve tried adding a resistor North side, ie between what you have as pin 3 (but on the MOC 3023 is pin 6) and the flash. Still the flash only works once – then I need to disconnect one of the 2 North side leads. Up to 220 ohm the flash fires once. At 1K and above the flash does not even flash once. I then tried changing the resistor South side. (between pin 2 and ground). At 220 Ohm it did not fire at all, at 18 ohm it fired once – like at 50 ohm. I then removed the LED / resistor and changed that with a Diode 1N4007. I have ultra limited electronics experience but I was under the impression that diodes allow electricity to only flow in one direction. Even tried it in both directions – exactly the same result: the flash always fired, but only once. My final finding: after firing the flash once, the flash is completely blocked. I cannot access any on-camera flash controls. I need to disconnect one of the leads. What’s stranger, is that even if I remove the power source from the arduino the flash remains blocked! Yes – even without electricity the opto remains closed. Yes, the SCR is a characteristic of the optoisolator. You can look up SCR on wikipedia to learn more. The electricity that keeps an SCR locked is coming from the flash not the arduino and that is why the SCR doesn’t turn off when powering down the Arudino. If you have an older high voltage flash that will work find with an SCR. The problem is modern flashes keep a trickle of constant current which makes an SCR get stuck open and that is why it only flashes once. More experiments waking up this morning. I had set the diode wrongly in the 1st experiment: now it works as designed, ie, flash will not fire when set up in the “wrong” way and only fire once when set up in the right way. All worked in the same way, ie only 1 flash except the Sigma – no flash at all. On the Canon and the YN 560 I tried both a hot shoe connection and a PC Port. So simply changing the opto to the PS 2532 should do the trick? I am waiting for a different type of optoisolator, but tried to use a transistor instead while waiting. Triggering the flash is simple in real life: just connect + and ground – FLASH! No external power involved. I’ve measured and there’s a continuous current of 2 mA and a voltage of 3.2V when the flash is idle and waiting between + and ground. 1K ohm Resistor connected to the transistor’s base, emitter connected to ground of the arduino and the ground of flash and collector connected to the + of the flash. Works very well – a few flashes… After that the other components on my arduino (LCD Screen) start misbehaving very badly (the flash still triggers – no problem). I remove the flash from the circuit and everything behaves normally. When I tried connecting a 100K resistor I immediately got a garbled LCD screen. Is there any chance I can have this working with a transistor? Or is the optoisolator really necessary? I was looking to do the same thing and got the same optoisolator as you (3023) Figured out a way to make the flash fire more then once, got the idea using your NPN (3904) trials. the ground (or negative) side of the wire to the E ot the transistor. Then on the C goes the positive side. The trick now is to boost the signal to turn it on using the B pin, to do so I put in parallel of C I put the pin 6 of the opto, then pin 4 of the opto goes to B. So when the opto is on, it opens up the NPN, and current flows, triggering the flash but without going to the Opto itself, so it doesnt lock up and you dont get some weird current reaching your Arduino and messing it up! Damn diagram came out ugly hopefully this will be better.. Ignore the tildes just used them so it doesnt get squished up.. I got a very old flash from 1980 the ‘national pe-2556’ if i put it on a slave drive and connect the 2 parts of the jack with a wire then i get a flash. I also have a ‘sigma em-140 dg’, if i try the same thing there then nothing happens, anyone know why that can be? I cant find the chip PS2532-1, I understand this is an old post so this chip may have a new name. I found the chip PS2501-1 that looks to be the same with 4 prongs. If you know where I can find the chip you used or if the one I found works that would be great. I’m tinkering with this, I like it – thanks! Question: Sadly, I do not have an optoisolator on hand – I do have a lot of digital ICs in my box though – I wonder if a NAND gate would be fast enough? Two Arduino digital outputs go HIGH when the laser beam is broken, that will make the output of the gate go LOW, triggering the flash. Just found a TI datasheet on this SN74LS00N I have, switching time is rated at <20 nanoseconds typical. Do you have an idea how I could wake up the Flash with Arduino, when it goes idle or goes to sleep? Compact 5VDC/1A SPST Reed Relay from radio shack. The opto is going to stay turned on via the scr junction due to the flash has a very small amount of current after it flashes. The flash is meant to be fired from a switch not a semiconductor. Scott, that is not true. Camera’s and flashes are meant to be triggered by a device meeting the trigger specifications from the manufacturer. As an example Canon and Nikon cameras don’t use relays to trigger a flash. As for camera triggers Canon’s TC80N3 remote uses a solid state trigger. The junction issue is more of a problem with modern flashes and SCR’s which is why I didn’t use an scr. That said if you want to use an scr there are well documented ways of making them work. Using relays is too slow for many uses.